Partnering with Vantage Data to power your HR Analytics will enable you to leverage HR intelligence while maintaining confidentiality to improve all aspects of employee development, engagement, leadership, productivity, and ultimately bottom-line results. Vantage Data HR Analytics solutions include Operations, and Talent Management modules. 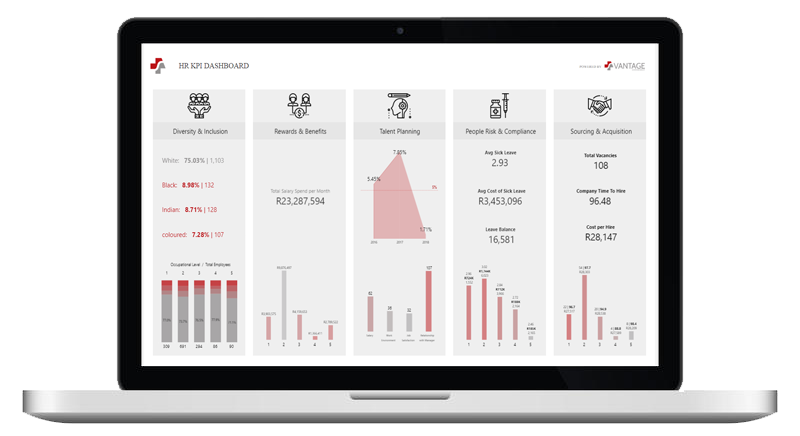 High level overview of your BBBEE stats against targets aligned to rebates and transformation planning. Understand and impact your Human Capital expenditure, as a % of operating costs at all levels within the business, critical to equal work for equal pay level to improve planning and efficiencies aligned to rewards. Manage and reduce attrition and cost of turnover. Manage and reduce leave liability and cost of unplanned leave. Manage acquisition spend and highlight opportunities for cost reduction as well as Time to Hire. Manage and reduce top talent attrition risk and costs aligned to critical succession planning, as well as understand ROI opportunities on Human Capital Investment. Calibrate people and business performance to understand and impact bottom line results through people performance. Engagement investment/ROI impact tracking as well as understanding correlations between retention risks, performance and engagement. Increased awareness and return on L&D investment, and efficient, focussed capital investment allocation. Cost and productivity analytics that improve workforce planning and manage overtime expenditure. Partnering with Vantage to power your HR Analytics will enable you to leverage HR intelligence while maintaining confidentiality to improve all aspects of employee development, engagement, leadership, productivity, and ultimately bottom-line results. Data integrated and managed with Vantage Vault, our proprietary data management platform. Single-Sign-On Access Governance enabled via Vantage Point. Some insight into returns from companies who have invested and leveraged their people data and HR Analytics.